According to MIT researchers, 2D carbon “paper” can be formed into stretchable supercapacitors that can power flexible electronic devices; researchers from Rensselaer Polytechnic Institute have designed new advanced materials for lithium-ion batteries. MIT researchers have now found that crumpling a piece of graphene “paper” — a material formed by bonding together layers of the 2D form of carbon — can yield properties that could be useful for creating extremely stretchable supercapacitors to store energy for flexible electronic devices, such as wearable or implantable biomedical sensors. The team said the new, flexible supercapacitors should be easy and inexpensive to fabricate because grapheme paper is a good candidate for making supercapacitors due to its large surface area per mass. The researchers explained that like batteries, supercapacitors can store electrical energy — electrostatically, rather than chemically — which means they can deliver their energy faster than batteries can. By crumpling a sheet of graphene paper into a chaotic mass of folds, the MIT team made a supercapacitor that can easily be bent, folded, or stretched to as much as 800 percent of its original size, and made a simple supercapacitor using this method as a proof of principle. A diagram of the crumpled-graphene supercapacitor (upper left). 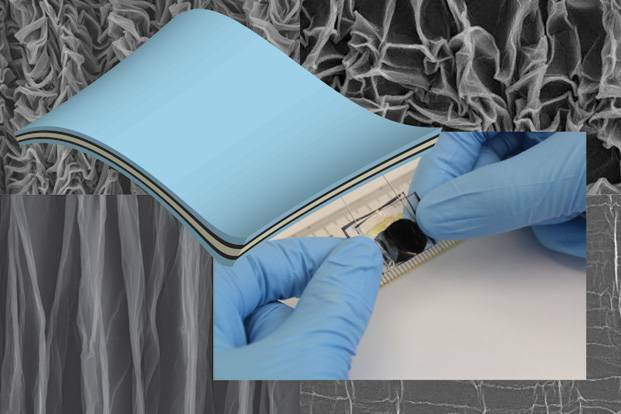 The top and bottom layers are the polymer used as a substrate, the two dark layers are the crumpled graphene paper, and the middle layer, shown in white, is the hydrogel, used as an electrolyte. The inset photo shows the actual supercapacitor, demonstrating how it can be bent without affecting its electrical properties. Even as widespread as lithium-ion battery use is today, there are limitations inherent in the current technology that prevents the batteries from being used more widely in electric vehicles and other high-power applications. Now, a team of researchers at Rensselaer Polytechnic Institute has developed a new material that addresses two of these limitations — mechanical and chemical. The use of nanomaterials is believed to help alleviate the mechanical limitation of lithium-ion technology in several ways; for example, by providing a thick forest of nanowires or nanorods in which the lithium ions can diffuse. But because of their larger surface area, these nanomaterials are more susceptible to SEI formation. 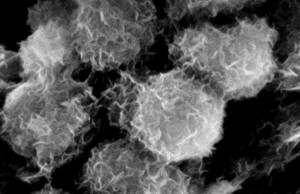 To attack the problem of both mechanical and chemical degradation, the researchers designed and developed an electrode from cobalt oxide mesoporous nanospheres. Shaped like tiny soccer balls with holes scattered across their surface, the hollow spheres suffer severe mechanical and chemical degradation and lose most of their energy storage capability. However, Lian and the research team discovered that, after many charge-discharge cycles, the hollow nanospheres are refined, reactivated, and eventually demonstrate unprecedented performance for a battery.